We all have certain abilities that enable us to make a contribution and gain satisfaction. When we use our abilities properly, we get a sense of self-worth and specialness. But sometimes those talents can also make us proud because we may feel superior to those who do not have such talents. To avoid such pride, we need to see our abilities appropriately. Gita wisdom explains that our talents are not our entitlements, that is, we are not entitled to have these talents. Even if we have certain abilities right from birth, still we didn’t do anything special in the womb to get them. Even if we developed those talents by commitment, still we can’t take credit for what we started with. Indeed, introspection will help us see that our talents are endowments – they are gifted to us by divine grace. 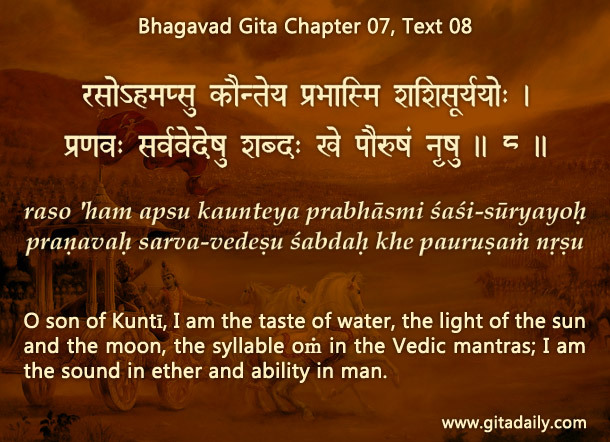 The Bhagavad-gita helps us gain this vision when it (07.08) declares that all the abilities we possess are the manifestations of God through us. He is manifesting a spark of his glorious infinite abilities through us (10.41). When we see our abilities as gifts from the divine, then our abilities won’t steal us of our humility. Rather, devotional contemplation and utilization on those abilities can deepen our humility. We will understand that Krishna has given these talents to us and he can take them away from us when he wants, as he did with Arjuna’s archery skills towards the end of his life. While we have those gifts, we can use them to serve Krishna and others in the mood of loving service. And by such a service attitude, we will go closer to Krishna, thereby enriching ourselves with devotion for him. Thereafter, whether we have or don’t have abilities, we will have Krishna – and that is life’s supreme attainment. Why are we not entitled to our abilities? How are our abilities endowments? How can we ensure that our abilities don’t steal our humility?